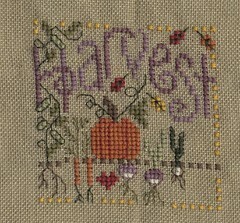 Nicole's Needlework: Harvest Fob Finished! I got all the stitching done on Harvest Fob last night. Now I just have to put it together! I had a little issue with that shop I was going to for stitch-ins. When I bought the linen and pearl cottons for Reed's Stocking I thought the total seemed kind of high, but I didn't think anything of it at the time. When I got home I realized she charged me $3.25 each for the DMC Pearl Cottons. I looked on the internet and almost everywhere I looked they were $1.25-$1.30. So I emailed her and asked if that was right and she emailed back saying yes, that's the right price. No explanation as to why. And then I realized the linen was about $10 more than other places also. I understand trying to make up for overhead, but that seems like a lot. So I'm not sure if I want to go back there. It just a principal thing with me I guess. I used to own a small cross stitch shop in Atlanta, and I would've never done something like that. And I had to pay rent, etc. I wouldn't take it out on my customers. I just wonder how long she can keep that up without people becoming aware of how much more they're spending. I found another shop online in Brandon called Roman Tales. They have stitch-ins on Friday nights, so I may check it out. From the picture it looks like a pretty nice shop. It's a little further drive though. Anyway, enough about that! After I do a little work for my brother I'm going to try to get this fob together! Write later! Wow, you learn something new every day. I had no idea you used to be an lns owner! That's crazy that she charged you so much for those DMC perles. =( I wouldn't want to go back either. Harvest turned out great! Beautiful work! Cute piece. It does seem extraordinary to charge so much for the threads. Are they bigger than normal? But I agree you have to boycott that. Can't wait to see your Shepherd's Bush stocking over one! The fob is great. Very nice stitching. That's cool that you used to own a needlework shop. How long did you own it for? I am sad to say I wouldn't go back either. A few cents for threads or $.50 for a chart is one thing, but charging almost three times the amount is wrong. Even with shipping cost it would be cheaper to order online. Wow, that's what we pay for the cotton perles here in Australia! In Aussie dollars! !